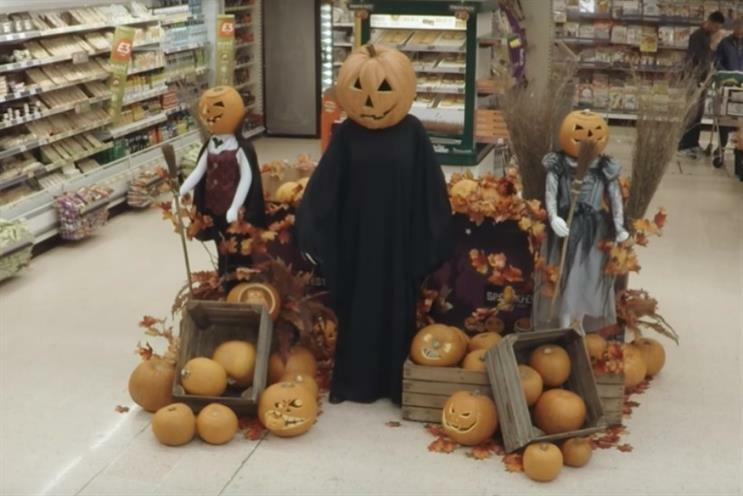 Shopping in any supermarket on a busy Saturday can sometimes feel like a nightmare, but not as scary as this Tesco store that has been decked out with spooky surprises. Perhaps you might be interested in trying a little severed hand instead of your favourite meat cut? Or maybe you'd like to pick up a ghostly head with your favourite brand of loo roll? To capitalise on Halloween festivities, Tesco has injected a bit of scary humour into the weekly shop with a number of unexpected items in the bagging area including a trolley moving around without a shopper, a pair of bloody hands at the fish counter and a butcher dressed up as a terrifying clown. Children were treated to a moving pumpkin display and some shoppers found themselves taken aback when they picked up a pack of loo roll, only to see a ghostly face behind it on the shelf. The YouTube spot, which has already racked up more than a million views, is accompanied by five short videos revealing how shoppers can create their own spooky stunts. The work is in keeping with the humour Tesco has recently resurrected in its marketing, beginning with a TV campaign featuring Ruth Jones and Dan Miller. Is Tesco ramping up to offer one hour delivery?